My heart breaks every time I read news from Iraq. So much so that I find myself clicking away or turning off the radio. Ramadi, the capital of al-Anbar province, has fallen to the Islamic State. 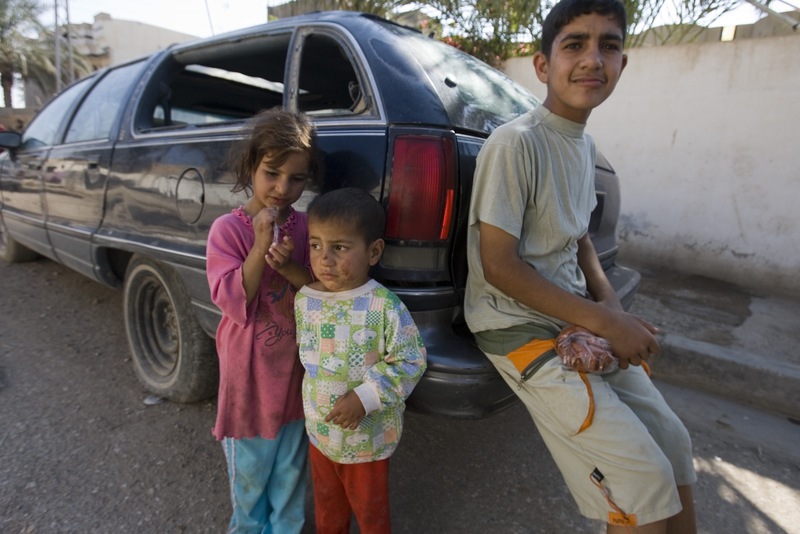 I think of the people I met there during the height of the Iraq War and have to stave off tears. Ramadi and nearby Fallujah were the two most dangerous cities for American soldiers and Marines. 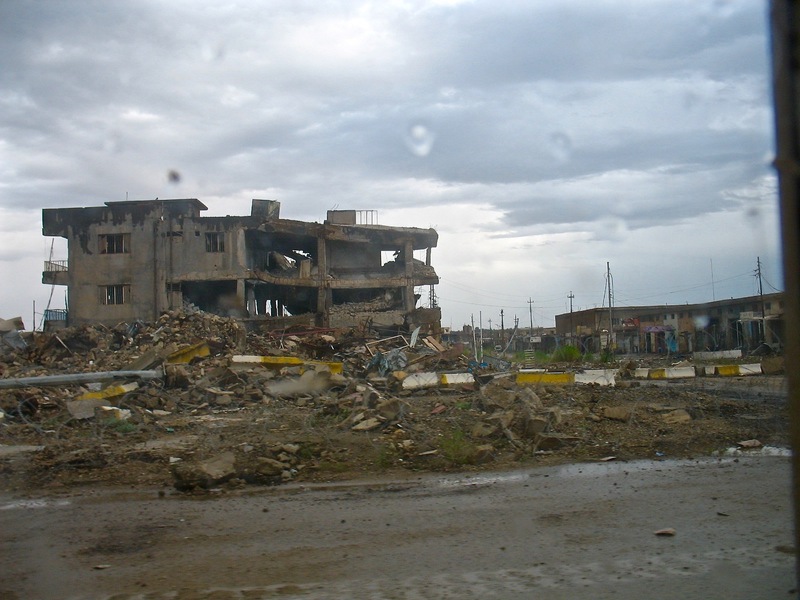 Ramadi was believed to be the most dangerous place on Earth. I was last in Ramadi in March 2007, when the Anbar Awakening was gaining strength, Sunni insurgents were laying down their weapons and there was, at last, a real hope for peace. Residents recounted the gross atrocities they had witnessed — assassinations and public beheadings, among them. They told me how they lived in fear so constant that eventually, they learned to go about their lives at that heightened level of anxiety. Ramadi never had a chance to recover. I found Ramadi apocalyptic. I did not see a single building that was not bullet-riddled or bombed. I did not speak to a single person whose life had not been shattered in some way. I wonder if those people are still there. Or did they escape? I hope so. What is it like to grow up with this kind of violence? Or to never be able to look forward to a future? It’s so hard for journalists in Iraq these days; too risky to walk the streets of Ramadi and talk to people. The stories are about battles won and territory lost. But we never hear the voices of human beings who are suffering. The U.S. and Iraqi governments are scratching their heads on how to retake Ramadi from the clutches of ISIS. But all the strategizing in the world feels futile at the moment. Ramadi, Iraq —- One afternoon last November, masked men raided the compound of houses belonging to Sheik Jassim Saleh Mohammed. The intruders held an AK-47 rifle against the throat of Mohammed’s wife. They burned two houses. They killed 17 women and children. They killed his brother. Mohammed was the first sheik in eastern Ramadi to turn against insurgents linked to al-Qaida in Mesopotamia. Today, he is part of a burgeoning movement of powerful Sunni tribal leaders who might have tacitly supported al-Qaida in the past but are fed up with the extreme violence. More than 40 sheiks have joined in a united front against both the insurgency —- which they say uses Islam as the rationale for slaughtering women and children —- and a perceived threat from Shiite Iran to the east. And they are cooperating with the Americans. They wield considerable influence in the heavily tribal Anbar province that stretches west from Baghdad to Iraq’s borders with Syria, Jordan and Saudi Arabia. Col. John Charlton, the overall American commander here, says the sheiks’ support has allowed U.S. troops to raid restive neighborhoods, purge insurgents and set up American-Iraqi police stations throughout Ramadi, where the police force had been all but wiped out. “The sheiks in this part of the world are the conduit to the community,” says Charlton, who heads the Fort Stewart-based 3rd Infantry Division’s 1st Brigade Combat Team, responsible for Ramadi since January. Building relationships with community leaders has been a key facet of U.S. counterinsurgency tactics in Iraq. Part of the much-heralded security push that began Feb. 14 in Baghdad put American forces in the neighborhoods they patrol instead of returning to isolated military bases. The strategy appears to be paying off here in Ramadi, where U.S. troops live in makeshift compounds throughout the city helping the Iraqi Army and police keep the calm. Signs of normalcy have started emerging in Ramadi, until recently a ghost town. A man sells produce at a roadside stall. 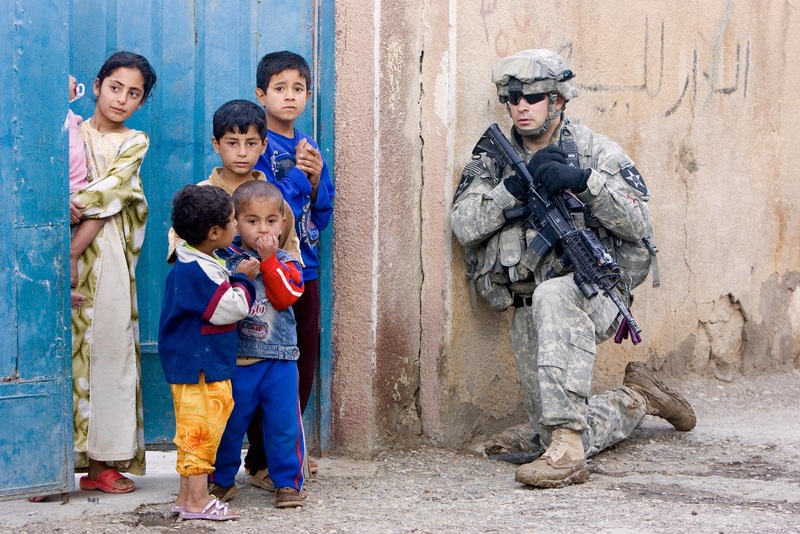 Laughing children walk down the street behind a woman who smiles and says “welcome” to passing American soldiers. Lt. Col. Miciotto Johnson, an Atlantan who commands one of Charlton’s battalions, Task Force 1-77 Armor, says Ramadi is a tale of two cities —- one where bloodshed was as routine as sunrise, the other where guns have almost fallen silent. The Iraqis say if you throw your hat into the air in Ramadi, it will come down with 12 bullet holes in it. A drive down the main east-west road that runs parallel to the Euphrates River conjures images of Hiroshima after the atom bomb. Not a single building stands unmarked. A fifth-floor balcony crashed to the sidewalk. Gnarled metal gates resembling Twizzler sticks. Carcasses of blown-up cars. Shattered glass. Trash everywhere. Facades of what were once apartments, offices and shops riddled with bullet holes. “Swiss cheese,” as the soldiers call it. Saddam Hussein’s troops and U.S. forces fought fierce battles here during the 2003 invasion. When the United States disbanded Saddam’s military, many of the disgruntled men came home to Ramadi. Anda Khalaf, a colonel in the former Iraqi Army, says the insurgency was imported to Iraq by foreigners but mushroomed here because so many men were sitting at home, jobless and angry. Last year, half the terrorist attacks in Iraq occurred in Ramadi. The city has been al-Qaida’s haven and America’s hell on earth —- the ugly, beating heart of the insurgency. The Americans believe democracy will help return this city to its people. On a balmy April morning, Mohammed, the sheik from eastern Ramadi, heads to a district meeting. He is the leading candidate in an election to choose the district of Sufia’s representative on the Ramadi city council. Mohammed wears the traditional dress for Arab men —- a pressed white dishdasha covered in a sheer black muslin robe with gold brocade trim. He is a simple man, a farmer who is not well educated. But he is smart enough to recognize his weaknesses and surrounds himself with polished men in suits and ties. American military officers are at the meeting to ensure Sufia’s first act of democracy is unblemished. Mohammed enters a two-story building where two U.S. infantrymen were killed in a recent firefight and where, today, local ballots will be cast. In a show of good faith, American soldiers and Marines around the building remove their body armor and helmets. Standing unprotected on the street, they appear uneasy. But there is no gunfire today. People are not giving the Americans the “evil eye,” a term soldiers use for glances that say: Get out. “I am in shock,” says Sgt. 1st Class Thomas Dougherty of the more tolerant atmosphere. Inside the building, the voting comes to a close. Mohammed, who heads the sizable al-Soda tribe, wins by a large margin. The Iraqis then serve lunch on long folding tables outside the meeting hall. Capt. Jamey Gadoury, commander of 1st Battalion, 9th Infantry Regiment’s Charlie Company, shares lamb and rice with Sufia’s community leaders and members of the Iraqi police. When asked what happened to the insurgents in Sufia, Gadoury stops chewing his food and grins. “You’re eating with them,” he says. What Gadoury means is that some Iraqis who planted bombs and pointed rifles at the Americans just a month ago now have switched sides. Yet with that welcome change comes uncertainty: There’s no easy way to tell good from bad. The police often don’t wear uniforms. They cover their heads and faces with rags, sling AK-47s on their shoulders and ride in the back of pickup trucks. They look disquietingly like insurgents. Ramadi’s ferocious fighting nearly wiped out the police force —- its numbers dwindled to 35 a year ago. Today, Johnson, the 1-77 Armor commander, says 4,500 police patrol the city through nine permanent stations and many more substations. Red squares and triangles on a U.S. military map indicate security posts throughout the city. A few months ago, the map was nearly void of the shapes. Now it is covered in them. 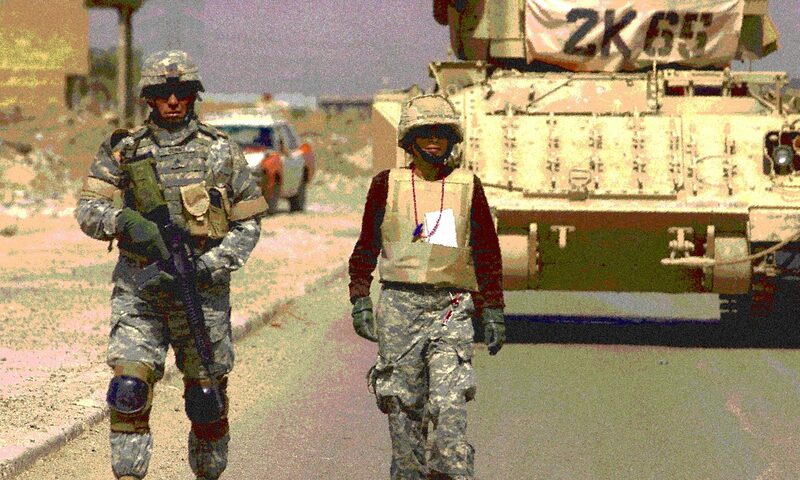 Every American soldier who has patrolled Ramadi’s streets knows how to predict danger. “Even if people don’t tell you anything, their body language does,” says 1st. Lt. Curt Daniels of 1-9 Infantry’s Able Company. When residents are asked what it was like here before the recent calm, they glide their right index finger across their throats. The insurgents brazenly beheaded people in public and distributed videos of the executions. Daniels walks over a road where patches cover craters created by improvised explosive devices. The Americans recently found 15 IEDs and 2,500 pounds of explosives in Melaab. In January, Ramadi suffered about 140 violent attacks a week. By the end of March, it dropped to a little over 60. Daniels says insurgents are “laying low now” after the sheiks cleared the way for security forces to saturate neighborhoods. Johnson, the 1-77 commander, says the peace will not hold in Ramadi unless local forces take control. If anyone can sniff out bad from good, Johnson says, it’s the local police. The day after his election, Mohammed, the sheik from Sufia, arrives at a joint Iraqi-American camp in central Ramadi for his first city council meeting. He clutches a gray file filled with notes and says he already has started thinking of reconstruction projects. Outside, the skies are ominous. It has been rained intermittently, but that’s enough to flood this city without any infrastructure. Mohammed wipes the mud off his leather loafers. He adjusts the white kufiya on his head and appeals to Ramadi Mayor Latif Obaid Eiada. “We need many things,” Mohammed says. Every district representative echoes Mohammed’s statements. Everyone is impatient. Charlton, the brigade commander, attempts to soothe the crowd. He knows that the 15 months his brigade spends here will only be the start of an arduous process. Charlton promises the Ramadi council that U.S. forces will support its reconstruction priorities. Realizing the fragility of the fledgling council, he implores them to keep on the right path. “We’ve worked too hard to let terrorists back into the community,” he says. Mohammed nods in agreement. He has paid the price for peace. Its been ten years to the day since Iraq and the IED that took those 4 troops that day. Im thankful every day for you and your photographer for being so kind and empathetic.